A sonically impressive, flexible and intuitive convolution reverb that offers an expensive sound and potential-packed Fusion-IR technology at a great price. Excellent value for money Superb sound quality. Fusion-IRs sound great. Zero-latency operation. Can be quite CPU-hungry. Scalable UI would help. In 2010, LiquidSonics' Reverberate convolution reverb plugin made a real impression with us. Now, almost six years later, we have Reverberate 2 (VST/AU/AAX). As with version 1, the key aspect of the plugin is its use of two impulse responses (IRs) at once (if desired). 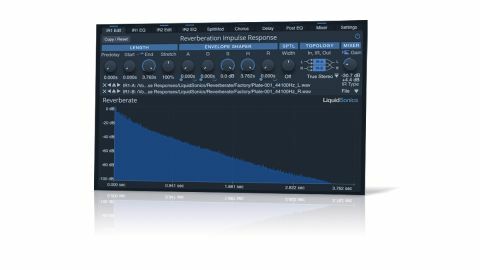 As of v2, though, Reverberate can also generate algorithmic early reflections and reverb tails from scratch, and take advantage of LiquidSonics' new Fusion-IR technology. The interface is navigated via ten tabs at the top (the eight of v1 plus Delay and SplitMod). The IR1 and 2 Edit tabs contain controls for shaping the early reflections and reverb tail of each IR, including Predelay, Start, End and Stretch dials for adjusting the IR's length, an ADSR amplitude envelope, and the new Spatial Enhancer for modifying stereo width. Also called up in the IR Edit tabs, the ER algorithm includes controls for setting the virtual room's type and Size, and the Diffusion, Separation and Depth of the reflections; while the Noise Tail Generator uses random noise with filtering and diffusion to smoothly progress from early reflections to reverb tail. Each IR (or algorithm) feeds into its own five- band EQ with a choice of per-band filter types, and a new addition in Reverberate 2 is time-dependent modulation of each band. This simulates the effect of high frequencies echoing with less strength than lower ones in a real space by subtly low-pass filtering the reverb as it decays. The new Sheen control, meanwhile, adds high-frequency gloss to impulse responses that are naturally dull. The new SplitMod tab houses controls for modulating the pitch of each IR's early and late reflections, with adjustable split time between them. This functionality is used by some high- end algorithmic reverbs to get a richer sound, and can be exploited in Reverberate 2 to thicken up IRs, or as a creative effect. The three Chorus effects (one for each IR and a third at the end of the signal path) of v1 are joined by three stereo Delays (one before each Chorus) with separate controls for each channel and the ability to feed one channel into the other for a ping-pong effect. The Mixer tab is where the Gains, Pan positions and Phases of the IRs are controlled, alongside IR Balance, Final Mix Dry/Wet and Gain dials, and an LFO for modulating the panning of both IRs and their relative balance. Other new features include a five-band Post EQ between the final Chorus and Delay modules, with two LFOs; a collapsible preset browser; five colour schemes; AAX compatibility; and two MIDI-assignable controls that can be mapped to many of the plugin's parameters. Reverberate 2 is flexible and easy to use, and includes some excellent presets. It does take a fair amount of CPU running in zero-latency mode, but the processing latency can always be increased. One thing that can't be changed, though, is the size of the GUI - it's tiny, cramped in places, and quite hard to read. That aside, Reverberate 2 is one of the best convolution reverbs around, and a steal at this price.